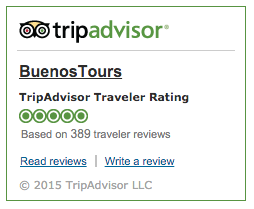 Why Take the “BA 101” Full Day Private Walking Tour? Our best-selling tour is the most effective way to see the diversity of Buenos Aires and its many neighborhoods in just one day! Get oriented with the physical layout of the city as well as the many layers of history and culture – it will all come together on this tour. You will be exploring BA through walking & public transport, the best way to see the city up-close & personal. It may seem like a daunting task to see “everything in one day,” but we can make it happen for you! Sounds like too much for just one day? No problem! Although designed to be taken in one go, the tour can also be split across two days, at a slightly higher price. If interested, please let us know the dates and start times you want and then we’ll get back to you with availability and how to book. 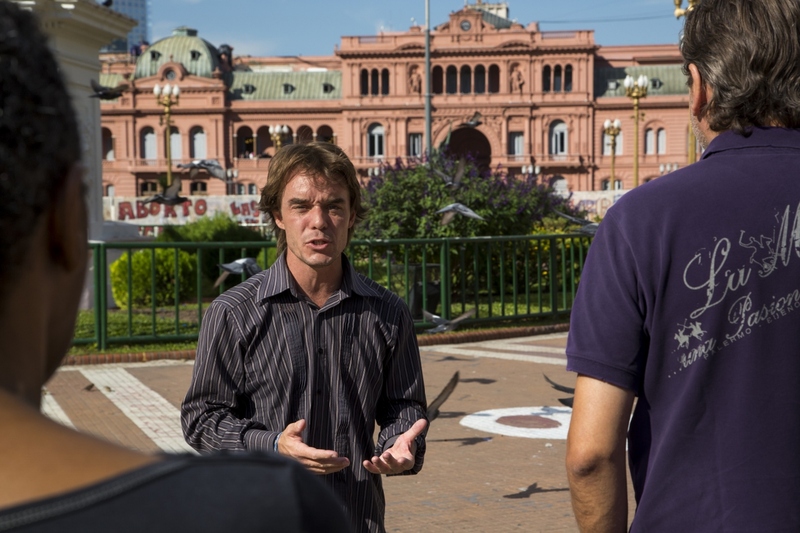 “We took the all-day, private walking tour of Buenos Aires with Oliver of BuenosTours… we were extremely pleased with everything about the tour… we learned and saw so much. Click Here to Book this BA 101 Full Day Tour Now! • San Telmo, the atmospheric home of tango, immigrant history, antiques and old cobblestone streets, centered around Plaza Dorrego. • The historical city center (Monserrat), full of beautiful churches, Plaza de Mayo, the Pink House (Casa Rosada), the Evita Balcony, the City Cathedral, Avenida de Mayo, and many more important landmarks. • A break at the oldest & most beautiful cafe in Buenos Aires, Cafe Tortoni, THE cafe in a city of cafes, founded way back in 1858. • The heart of the barrio of Retiro – Plaza San Martin, a leafy park surrounded by beautiful architecture and filled with monuments. • The widest avenue in the world, Avenida 9 de Julio, home to the famous Buenos Aires Obelisk. • Lunch at a traditional Argentine restaurant with your guide – a place where locals eat, with a choice of dishes to cover all tastes. • Recoleta, the most prestigious traditional neighborhood, full of grand old mansions and high class establishments, where we’ll stroll along the elegant and upscale Avenida Alvear and into Plaza Francia, the heart of Recoleta. • Finally, the tour highlight: Recoleta Cemetery, the last resting place of Eva Peron and many other rich & famous Argentines, plus the highest concentration of beautiful architecture in the city. You can also tweak the itinerary to your interests in discussion with the guide on the day, or in advance, of course! • For tour quality purposes, for groups of 12 or more people, we ask you to split your group into two smaller groups, with a private guide for each, and booking two separate tours (they can be at the same time). Of course, if you absolutely must keep your group of 12+ together, then feel free to reach out to us first and we’ll see what we can do. • Are you are a solo traveler? 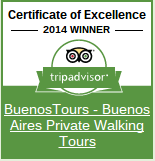 Our tour is a great way to enjoy your time in Buenos Aires, being introduced to the city with a local friend. Please feel free to ask us if we have any seasonal discounts for solo travelers. • You get approximately 7 hours with your guide from the walking tour start point to the tour end. As stated on our FAQ, we will meet you at your accommodation (within the city of Buenos Aires) to accompany you to the tour start, usually by taxi, or for most larger groups, MPV/people carrier or minivan. Or if you are staying very near our start point, we’ll walk with you there. The cost of any transport needed at the start of the tour is already INCLUDED in the total price of the tour. • Important before booking: Apart from the inclusion of the cost of any transport (from within the city of Buenos Aires) at the start of the tour, we recommend reading through what else is included in and excluded from the tour cost, plus our cancellations policy, along with other frequently asked questions about our tours. • Your total time on the tour will be somewhere between 7 to 8 hours. This estimate factors in transport time to the start of the tour, so depends on the location of your accommodation & traffic on the day. • You could choose to extend this tour by 1 hour to include the colorful neighborhood of La Boca at the start of the tour. To do so, you would book your tour using this link (instead of the other links elsewhere on this page or the calendar below). We recommend starting between 8.30am and 10am. However, feel free to select another start time during the booking process if you prefer. After you have selected your date below and then start time, you will be guided through the online payment process to book your tour. If the date/time you want isn’t available, feel free to send us a message using this form, and then we could let you know if we get any cancellations for that day. Alternatively, click here if you have a question before booking. We’re here to help!